The Toyota Etios Liva Cross may soon make its debut in the Indian market. The surprising possibility got a big boost when the car was recently spotted and clicked in Pune. Riding upon its international success and recent launches in South American countries like Brazil and Argentina, India seems to be the next target for the company. The company has given no official word about this and hence many are speculating that this could well be the ‘SUV’ that the company has been indicating for the past some time. 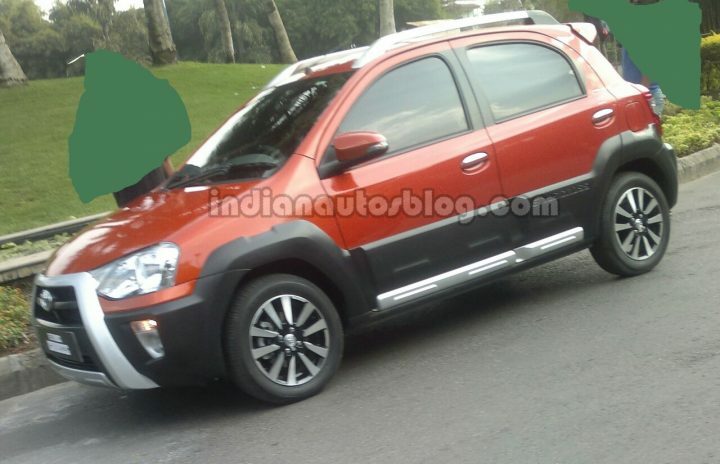 To understand Etios Cross, you can consider it a ramped up version of Etios Liva. It will run on the same engine as in Liva TRD Sportivo. This is a 1.5L petrol engine that can produce a maximum of 90hp power. The add-ons which make it even more apt for the Indian conditions include additional side cladding, silver skid guard (over the cladding), bulged up wheel arches and diamond-cut alloy wheels etc. For a delightful look, the Japanese automaker has refurnished the front face of the car. Now it looks smarter (or uglier, depending on who you ask) than the typical Liva. The silver roof rails and redesigned interiors are pleasant to look at and should be better to feel too; these factors will surely add to the driving comfort and the character of the car as well. The Toyota Etios Liva Cross will be more of a competition to the Volkswagen Cross Polo than any SUV such as the Ford EcoSport or Renault Duster. Given that the 2014 Indian Auto Expo is round the corner, it is pretty much possible that the car may be launched at the grand event. If this happens, this could be a welcome move from Toyota which does not have any significant presence in the entry level crossover segment. To fill this gap, the company had recently introduced new top of the line VD and VDSP variants with diesel power option in the market for Etios Liva. However, the dynamics of the segment demand that the company plays the pricing game correctly and provide an attractive value for money. What do you think of the Toyota Etios Liva Cross? Let us know in the comments section below.